She was a twenty-two year old Fulbright scholar from New York fleeing her immigrant Italian family’s claustrophobic love, he was a thirty-eight year old Catholic priest from the city’s Irish tenements of Hell’s Kitchen, researching Church archives. They met in a Perugia café in 1957: a thunderbolt, opera’s grand coup de foudre of destiny. Their affair, shamelessly shameful, was to be sub rosa, under Cupid’s rose of secrecy. In small rented rooms, in the fervid, emotive culture, Italy itself seemed to become their duenna and collaborator. They returned to New York, she to an apartment on the Upper West Side, he (as fate would have it) to a parish blocks away, the fiction of their friendship so carefully maintained that not even her own family knew the father of her children. Ironically, their private war against the Church’s conservative patriarchy augured the decade’s larger battles of civil disobedience and feminist freedom. With their own adopted neighborhood soon slated for massive urban renewal, which would displace so many working poor, Father Harry Browne moved quickly into political activism. (It was in Father Browne’s office that the FBI arrested Father Berrigan, notorious for burning Pentagon draft records to protest the Vietnam War.) Thus, as in opera as in life, love and politics are ever held close, one of the many paradoxes Alaya so lovingly, so wisely ponders in Under the Rose. Now a professor of literature at Ramapo College, New Jersey, Alaya dedicates her memoir to her two fathers: Father Browne, her husband and father of her own three children, who died in 1980, and her own father, whose indelible Italian nature created her own ambitious, fierce needs. Those asking for theology or psychotherapy may be disappointed, but those asking for well-written honesty will be handsomely rewarded. In a poignant, lucid language that combines the pace of fiction with the intimacy of a love letter, her “memory-ghosts” bring private and social history to full circle, the story of an immigrant’s search for freedom of expression. 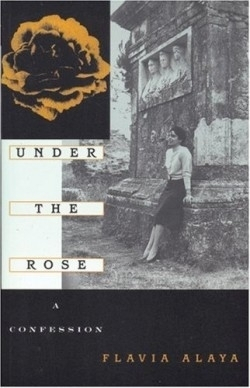 Under the Rose is the very model of memoir writing, of a woman’s voice finally finding perfect pitch.